Four teenagers discover an old video game console. 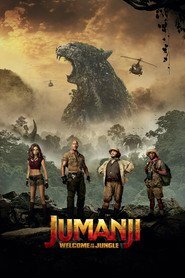 The tables are turned as they are sucked into Jumanji's world - pitted against rhinos, black mambas and an endless variety of jungle traps and puzzles. To survive, they'll play as characters from the game. Great fun with lots of action and humour. Dwayne Johnson, Kevin Hart, Jack Black, and Karen Gillan all approach their characters with tongues firmly in their cheeks and there’s great chemistry between them all. The story is fast-paced with the action laid on thick. The whole thing is a great piece of family escapism. Thoroughly entertaining.